Mattermost 3.1 is our 9th consecutive release made on the 16th of the month. Releasing monthly provides a stable, predictable process lets our community do its best work. Our June release follows in that tradition with more compelling improvements: Notification upgrades to Apple Watch, phone, web and PC, a new compact view option, keyboard shortcuts, upgraded System Console, new OpenShift and CloudFoundry installers and so much more. Note: Mattermost 3.1 includes security updates and upgrading is recommended. For each Mattermost release we’re now awarding the title of Most Valuable Professional, or “MVP”, to an outstanding contributor in each release. Our MVP for Mattermost 3.1 is Thomas Balthazar, who completed a record high of 9 accepting pull request tickets in a single month. Huge thanks for making a difference in 3.1! With a few simple settings, Mattermost can customize notifications across all your devices. For example, after you’ve chosen your preferences, Mattermost notifications will intelligently appear across your Apple Watch and iPhone–and they even support emoji! Specifically, when someone mentions you and you’re on your iPhone, you get the notification on your phone and not on your Apple Watch. When you put the phone in your pocket and someone mentions you again, it shows up on your watch, and not on your phone. It works like you expect by default. In 3.1, mobile notifications work like desktop notifications (rather than like email notifications in previous releases). From Account Settings > Notifications you can define whether you want mobile notifications for all activity, for just mentions and direct messages or if you want to disable them completely. You can further customize your mention triggers to alert you on your first name, username, nick name and full name, and also on custom keywords you’d like to listen for across conversations. It’s like having super human listening skills. Read more about shortcuts from our new product documentation. Big thank you to everyone who discussed, voted on, and contributed to these features! Sometimes you want to see more on the screen at once. For those days, we now have a Compact View option from Account Settings > Display that reduces whitespace and hides image thumbnails so more posts can be seen at the same time. Here are some examples of the Standard (above) and Compact (below) views for comparison. After a wide range of usability testing and user feedback, we’ve reorganized the System Console to make settings easier to find. The community pours their time and energy into shipping powerful features for IT admins to enjoy, and if users can’t find and understand the feature, it’s as if it doesn’t exist. For multi-lingual organizations, the System Administrator can now set multiple default languages for the server and the client, as well as limit the number of languages are available in Account Settings. Webhook posts now support advanced formatting through the use of message attachments. Include author information, titles, images, and thumbnails to customize the look of your integration posts. Minor improvements were also made to improve Slack Compatibility. For example, it is now possible to notify @channel by using <!channel> in the post text. Enterprise Edition E20 now supports deployment on multi-node database clusters. Support includes the ability to add multiple read replicas to your database deployment, plus the ability to load new configurations into the Mattermost server while it continues to run. We’ve got some amazing work from the community this month to showcase as well. OpenShift Origin Installer, thanks to goern. 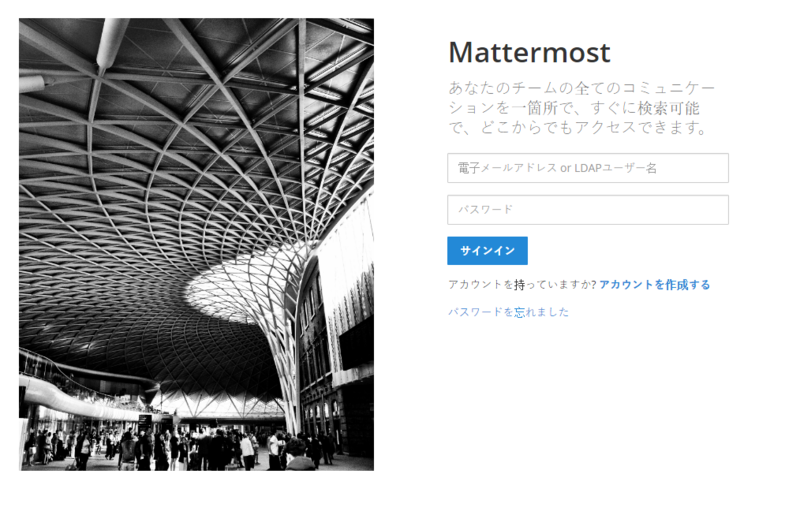 A new Cloud Foundry installer by ArthurHlt for running Mattermost privately inside a CloudFoundry like Bluemix or PWS. While German language translation narrowly missed the release timeline for Mattermost 3.1, it is nearly ready for Mattermost 3.2. Huge thanks to meilon for being our #1 translator this month and for krawalli‘s help to bring German language translation above 95% completion. Mattermost Enterprise Edition E10 and E20 are commercial versions of Mattermost designed for large organizations and available by subscription. See the feature list for more detail. Thanks again for joining us for the release of Mattermost 3.1. We’d love to hear your thoughts, questions and feedback in the comments below. How was the length of this post? Anything missing, anything you feel wasn’t necessary? What would you like us to blog about in future? Your current production docker guide does not work. After running through the process the web docker says unhealthy and you get a 502 when trying to go to the site.